These are maintenance and inspection items that are considered to be the owner's responsibility. The owner can do them or they can have them done at a service center. These items include those that should be checked on a daily basis, those that in most cases do not require special tools, and those that are considered to be reasonable for the owner to do. Maintenance requirements vary depending on the country. Check the maintenance schedule in the owner's manual supplement. Determine the appropriate time to service the vehicle using either miles driven or time (months) elapsed, whichever reaches the specification first. Maintain similar intervals between periodic maintenance unless noted. Failing to check each vehicle part could lead to poor engine performance and increase exhaust emissions. (a) Check that the headlights, stop lights, taillights, turn signal lights, and other lights illuminate or blink properly. Also, check that they have enough brightness. (b) Check that the headlights are aimed properly. (a) Check that all the warning lights and buzzers are working. (a) Check that the horn is working correctly. (a) Check for scratches, pits or abrasions. (a) Check that the washers are aimed properly. Also, check that the washer fluid hits the center of the operating range of each wiper on the windshield. (b) Check if the wipers streak. Replace the wipers if necessary. (a) When the air conditioning is on the defroster setting, check that air comes out of the defroster outlets. (a) Check that the rear view mirror is securely mounted. (a) Check that the sun visors move freely and are securely mounted. (a) Check that the steering wheel has the proper amount of free play. Also check for steering difficulty and unusual noises (See page ). 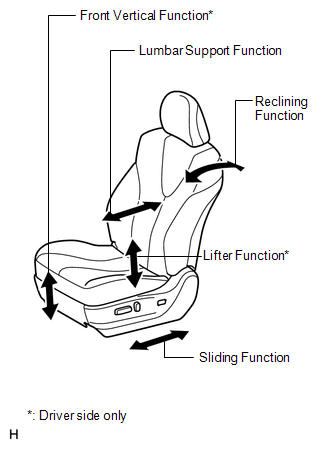 (a) Check that the seat adjusters, seatback recliner and other seat controls operate smoothly. (b) Check that all the latches lock securely in all positions. (c) Check that the locks hold securely in all positions. (d) Check that the headrests move up and down smoothly and that the locks hold securely in all latched positions. 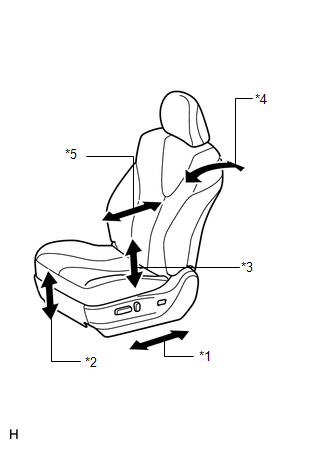 (a) Check that the seat belt components, such as the buckles, retractors and anchors, operate properly and smoothly. (b) Check that the belt webbing is not cut, frayed, worn or damaged. (a) Check that the pedal operates smoothly. Check that the pedal does not have uneven resistance or stick in certain positions. (a) Check that the pedal operates smoothly. (b) Check that the pedal has the proper reserve distance and free play (See page ). (c) Start the engine and check the brake booster function (See page ). (d) Start the engine and check the brake system indicator. (a) In a safe place, check that the vehicle does not pull or lead to the side when applying the brakes. (a) Check that the parking brake pedal has the proper amount of travel (See page ). (b) On a slight grade, check that the parking brake alone can hold the vehicle in place. (a) Check the lock release button of the shift lever for proper and smooth operation. (b) When the shift lever is in P and all brakes are released in an area that has a slight grade, check that the vehicle is stable.